China was dubbed an “emerging force” in drone warfare in and called a “rising drone power” by 2015. In four short years, its status has gone from “new” to “leading” on multiple fronts in the drone domain. One of those fronts is the application of (militarized) drone technology in sea operations. For over a decade, the United States was the undisputed leader in unmanned development and deployment in East Asia. From the Grey Eagles deployed in South Korea to Global Hawks flying from Japan, and more recently tests with the X-47B, the Sea Hunter USV, and a generation of UUVs under development that should enable U.S. attack submarines to discover other potential underwater enemies more quickly than in previous years. The drone’s speed and below-the-radar-coverage translates into a potentially deadly reduction in reaction time for whatever lies in its sights. The detection-speed metric would probably afford the target vessel less than a minute to defend itself, presenting a looming threat for even the most advanced warships. The U.S. Navy (USN) could still rely on its Naval Integrated Fire Control-Counter Air (NIFC-CA) technology, which can project existing naval sensory ranges through E-2D coordination. The Hawkeye aircraft, operating some 25,000-30,000 above a warship, can act as the task force’s eyes, possibly detecting incoming attackers from a distance of several hundred kilometers. Such coordinated defensive action can put a much-needed cushion of time between the run-up to attack and the prosecution of an assault against America’s naval giants. Yet for other nations, this “warthog” poses a new lethal treat. With an estimated range of 900 miles, it certainly stretches China’s capabilities to project power from its shores – that’s two to three times the range of a conventional cruise missile or what are colloquially called “sea skimmers.” China’s drone-missile hybrid can be launched from a land-based military installation and dart out to sea. Using its onboard radar technology, the unit would seek out an enemy target and execute a strike much like an advanced cruise missile. However, the hybrid would carry with it a lower price tag than a conventional cruise missile and would therefore by far more expendable than its pure missile counterpart. In this, China’s new system would be far more economically viable to deploy and operate than the DF-21. Yet most striking in this development is China turning from the development of UAVs for aerial purposes toward unmanned systems aimed at tasks in the maritime realm. 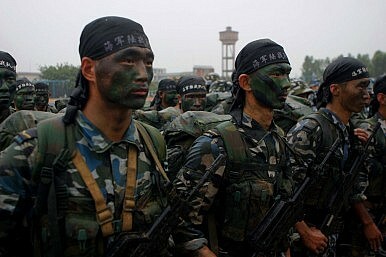 With the People’s Liberation Army Navy (PLAN) and Air Force (PLAAF) increasingly becoming main military actors, and the South China Sea, East China Sea, and general naval expansion as centers of military attention, China appears poised to steer its R&D regarding new (unmanned) military systems in the direction of systems that would benefit operations in the naval realm. A second striking feature is how the development of unmanned systems is slowly moving toward the development of armed, next-generation unmanned systems. Unarmed systems could still be used in the maritime realm, and indeed China has deployed them to its new bases in the South China Sea, but their survivability in any possible conflict will be limited, or even non-existent due to a lack of defense capabilities. The development of sea-skimming drones exemplifies China’s desire to weaponize its current, and especially its next, generation of unmanned systems slated for East Asia waters and the Pacific. Such systems, moreover, would complement China’s larger A2/AD naval strategy, which aims to prevent the U.S. Navy and other allied naval forces from operating safely within the first island chain. Furthermore, the drone-missile hybrid paves the way for near-future military applications with the basis for building on the concept of drone swarming in a unique unmanned domain. A U.S. carrier task force could be quickly overwhelmed by an aerial armada of these new deadly weapon units steaming at high speeds directly toward it. In expansive waters, the threat level posed through the application of this lethal devise is high enough, but when prosecuted in tight littoral regions such as the Taiwan Strait or waters adjacent South Korea and even Japan, evading the weapons could be tricky business. Tobias Burgers is a doctoral candidate at the Ott-Suhr-Institute (Free University of Berlin) where he researches the rise and use of cyber and robotic systems in security relations, and the future of military conflict. Scott N. Romaniuk is a Ph.D. candidate in International Studies (University of Trento). His research focuses on asymmetric warfare, counterterrorism, international security, and the use of force. Russia Inducts Its Own ‘Carrier Killer’ Missile, and It's More Dangerous than China’sRevealed: The Details of China's Latest Hit-To-Kill Interceptor TestChina Tests New Missile Close to Korean PeninsulaChina’s Drone Grab and the Dangers of 'Strategic Ambiguity'Should the Pentagon Fear China’s Newest Weapon?